Sizing Europe won today’s sportingbet.com Queen Mother Champion Chase, following up his victory last year in the Irish Independent Arkle Trophy. The nine-year-old became a second winner of the week for owners Ann and Alan Potts, trainer Henry de Bromhead and jockey Andrew Lynch, who teamed up to win yesterday’s Glenfarclas Cross Country Chase with Sizing Australia. De Bromhead, in a state of shock, said: “It’s unbelievable - after he crossed the line I turned to some poor man and said, ‘Did Sizing Europe just win the Queen Mother?’ and he said ‘Yeah’. God the horse was good, and Andrew was phenomenal. Sizing Europe was second to Kauto Star over three miles at Down Royal in the autumn, and De Bromhead said: “We always said the King George would be our decision maker on the subject of whether to stay at three miles, and when it was postponed [he didn’t take part in the rescheduled race following a rough trip back to Ireland] we started thinking he always performs so well at Cheltenham over two miles, let’s go for the Queen Mum. “Good ground makes such a difference to him, and he’s very much more relaxed these days - he’s either dead or in a chilled-out zone. I was pretty wound up before the race, but got a bit brave and managed to watch it. “All I was doing was praying, but we know he stays up the hill, all bar his run in the  Champion Hurdle. He’s been unbelievable for us and I’ll be lucky to ever come across another one as good. Alan and Ann Potts have been great supporters of my yard - when they joined I’d had just three winners in my first season. We’ve gone from strength to strength. Henry de Bromhead, celebrating a double at the 2011 Cheltenham Festival courtesy of Sizing Australia in yesterday’ Glenfarclas Cross-Country Chase and Sizing Europe in today’s feature race, admitted that he treats Sizing Europe as one of his own children. “I’m very protective of him,” said the trainer, who has three children, two-year-old twins Jack and Mia and recent arrival, Georgia. “He’s like a child to me. Just ask my wife, she’ll tell you that I spend more time with him than with anyone else. Sizing Europe missed the rescheduled King George VI Chase in mid-January after he had endured a difficult passage back to Ireland when the original meeting was lost to bad weather. “We’d always said that the King George would be our decision-maker and when that was cancelled we had to rejig. He took a long time to recover from the journey home and he has only really started to thrive in the last few weeks. He jumped really well at home last Thursday,” said the trainer. “Last year in the Arkle his jumping was phenomenal and Andrew [Lynch] rides him really well. He put up such a performance today. The stats on Arkle winners going on to the Queen Mother [Champion Chase] helped in making the decision to drop him back down to two miles. 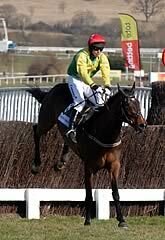 After disappointing when sent off favourite for the 2008 Champion Hurdle, Sizing Europe was found to have strained his sacro-iliac joint (pelvis) and was subsequently sent to one of Ireland’s best showing and event riders, Rosemary Connors, who has put in plenty of flat work with the dual Festival winner. “Mentally he loves it and physically it has turned him inside out,” admitted de Bromhead. Colm Murphy offered no excuses as Big Zeb came off second best in his bid to land the sportingbet.com Queen Mother Champion Chase for the second year running. Barry Geraghty’s mount landed the two-mile championship event last year and took the inside route around the course as he tried to double up. Sizing Europe was always just in front of him, though, and he maintained that advantage up the hill to lower the champion’s colours by five lengths. Murphy said: “He has ran a blinder and the winner was very good. “Barry said the ground was very dead and it was a lot quicker last year but I am delighted with the way he has ran. Trainer Eddie Harty was delighted with Captain Cee Bee’s effort to finish third in the sportingbet.com Queen Mother Champion Chase and hopes to come back to Cheltenham in 12 months’ time. Master Minded, winner of the sportingbet.com Queen Mother Champion Chase twice before, was sent off the 2/1 favourite but could only finish eighth after blundering two out.